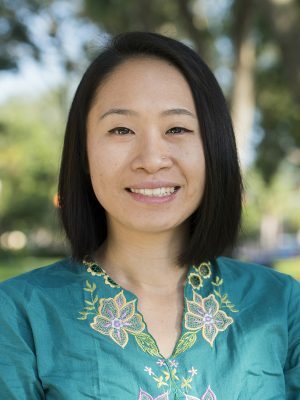 The 2018-19 Stetson Spotlight Series continues on April 26 with a presentation by Dr. Dengke Chen, Assistant Professor of Digital Arts, who will speak on “A Comparative Study and Virtual Representation of Construction Technique and Traditional Carpentry of Dong and Han’s wooden Architecture”. Snacks will be available. All are welcome! SPOTLIGHT NOW OFFERS CULTURAL CREDIT! Please encourage your students to attend. Click here for a complete schedule of Stetson’s Spotlight Series. As one of the minority groups primarily located in the mountains of southern China, Dong people are famous for their unique carpentry skills and traditional construction techniques. By the impact of urbanization and lacks of succession to the young generation, these skills are endangered. My project attempts the preservation of the rare cultural heritage by analyzing and virtual representing Dong’s carpentry skills and construction techniques through interdisciplinary design. Dengke Chen holds an M.F.A. in new media from the Pennsylvania State University and a B.F.A. in animation from the China Central Academy of Fine Arts. He comes to Stetson from the Pennsylvania State University, where he taught as an adjunct professor and an instructor. Chen specializes in 3D animation and digital video. As a graduate research assistant, he created animations to describe a balanced approach to integrating environmental, economic, sociological and aesthetic dimensions of landscape through strategic research and design. He has worked on numerous commercial projects and also as an art director for a popular children’s TV show for China Central Television. With a strong art background and professional experience, he explores the magical world of storytelling in his work, which can be new media, 2D or 3D animation, digital painting and comic art. The Stetson Spotlight Series at Stetson University is a showcase of faculty research, creative inquiry, and other scholarly engagement to the campus community. Presenters are primarily recipients of grant awards through the Stetson Summer Grant Program. Click here for a complete schedule of the Stetson Spotlight Series. The Burmese python is one of the largest snakes in the world and a native of southeast Asia. For more than 15 years, the gigantic snake has decimated species and become the ruling reptile in the Florida Everglades. Prior research by Melissa Miller, Ph.D., interagency python management coordinator of the Florida Fish and Wildlife Conservation Commission, and her colleagues found that in addition to eating many birds and mammals, the Burmese python problem has reached a new level of worrisome concern because it carries a parasite that infects native snakes in south Florida. (Left to right) Biology junior Jenna Palmisano, Ryan McCleary, Ph.D., Brown visiting teacher-scholar fellow in biology, and biology senior Maddy Wheeler conduct a lung flush to obtain a parasite egg sample from the lung of an anesthetized pygmy rattlesnake. The lung flush determines if the snakes have mature parasites in the lungs. Photos/Terence Farrell, Ph.D.
A new study, “Spillover of Pentastome Parasites from Invasive Burmese Pythons to Pygmy Rattlesnakes, Extending Parasite Range in Florida, USA,” is based on research by Terence Farrell, Ph.D., professor of biology at Stetson University; Joseph Agugliaro, Ph.D., assistant professor of biology at Fairleigh Dickinson University; Heather Stockdale Walden, Ph.D., assistant professor of parasitology at the University of Florida; Jim Wellehan, Ph.D., associate professor of zoological medicine and microbiology at the University of Florida; April Childress, lab manager at the University of Florida; and Craig Lind, Ph.D., assistant professor of biology at Stockton University. The research findings published in the Society for the Study of Amphibians and Reptiles’ journal Herpetological Review suggest that pentastome parasites or worms, are the likely culprit behind the deaths of three pygmy rattlesnakes at Lake Woodruff National Wildlife Refuge in DeLeon Springs, Florida. Pygmy rattlesnakes are venomous snakes native to the southeastern United States. The research was funded by the Brown Center for Faculty Innovation and Excellence at Stetson University and a research and professional development grant from Stockton University. 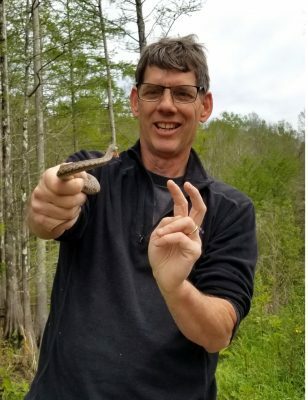 Last August, Farrell and Stetson’s former Brown visiting teacher-scholar fellow in biology Lind, found one of the pygmy rattlesnakes they were studying dead with parasitic worms crawling out of its mouth. 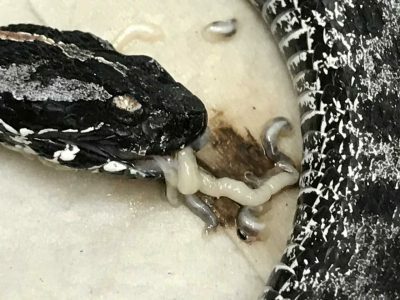 A dead pygmy rattlesnake is shown with parasitic worms crawling out of its mouth. 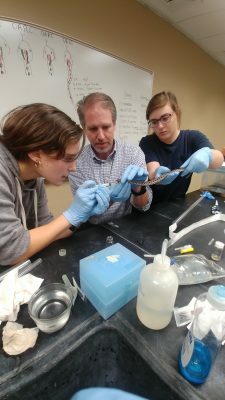 Stetson’s biology faculty and students conducted the preliminary testing, including examining and dissecting the three pygmy rattlesnakes, and found the parasites in the lung and trachea areas, and was consistent with past parasite research findings. These parasites typically reside in the lungs of reptiles that become infected after eating contaminated prey. The Stetson team collaborated with professors and a lab manager at the College of Veterinary Medicine at the University of Florida who administered a polymerase chain reaction test, which provides researchers with additional DNA and a better way to identify pentastome parasite species. The DNA sequences of the parasites found in the pygmy rattlesnakes were consistent with the parasite species from southeast Asia, which are normally found in Burmese pythons. Farrell and his team of researchers have found the parasites in Central Florida, which is more than 100 miles away from where the Burmese pythons reside in the southern portion of the state. “Our research shows that the parasites are moving north rapidly along the peninsula and appear to have some major health effects on pygmy rattlesnakes,” said Farrell, who was the paper’s senior research author. Burmese pythons evolved in Asia with these parasites, but it’s a new problem for pygmy rattlesnakes and other Florida snakes. Stetson’s biology students are obtaining hands-on experience and conducting cutting-edge research about this new snake epidemic. The study will provide them with the tools they need for their science career. The parasite phenomenon is a reason to worry. 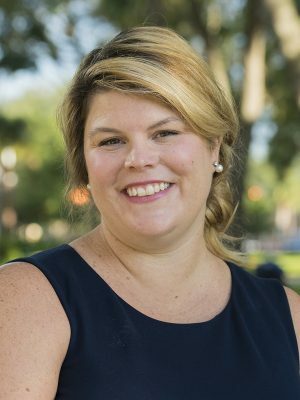 Heather Evans-Anderson, Ph.D., assistant professor of health sciences at Stetson University, is the recipient of a PALM Network fellowship and the 2019 Willa Dean Lowery grant. She will use the funds, totaling $13,000, to create a student-centered, technology-rich and active-learning classroom for her anatomy and physiology classes and further her research on communication between cardiac cells during the early stages of heart development using CRISPR technology. The funding also provides an opportunity to present her research at national conferences. The research process includes traveling to conferences and meetings to present and share research findings with field colleagues and experts. Travel and research expenses can add up, but funding from fellowships and grants can provide a researcher with financial support. The PALM Network is a national group of dedicated teachers who are committed to active teaching and learning in life science education and STEM classrooms. The fellowship, which is funded by the National Science Foundation (NSF) Research Coordination Networks, provides funding to support training in order to promote use of evidence-based, active-learning strategies in teaching. The organization also provides a chance for fellows and mentors to collaborate on specific goals as well as participate in journal clubs to discuss teaching strategies that promote learning. Evans-Anderson will be working with an expert on the science of learning. Her mentor, Mari K. Hopper, Ph.D., is the associate dean of biomedical sciences at Sam Houston State University’s College of Osteopathic Medicine in Huntsville, Texas, has published several papers on active learning. Evans-Anderson will be presenting preliminary data from the pedagogical research that has been conducted as a result of The PALM Network program during the Human Anatomy & Physiology Society conference in Portland, Oregon in May. The Willa Dean Lowery grant will provide Evans-Anderson with an opportunity to further her research using CRISPR technology, which allows a user to cut and replace DNA sections to edit genes in a living organism. Evans-Anderson and her students will use CRISPR to study endothelial and cardiomyocyte cell interactions by genetically modifying an invertebrate organism to investigate the regulatory mechanisms of heart development. CRISPR stands for Clustered Regularly Interspaced Short Palindromic Repeats. Evans-Anderson collaborated with Lynn Kee, Ph.D., assistant professor of biology at Stetson, and her advanced genetics class students for preliminary work required for the Willa Dean Lowery grant. The students will be presenting their work during the Stetson Showcase on Tuesday, April 16. Evans-Anderson sees great potential with using CRISPR technology as an educational tool and will present her classroom work with CRISPR during the annual American Society for Biochemistry and Molecular Biology and Experimental Biology meeting in Orlando on Sunday, April 7. Students also will have an opportunity to present preliminary research findings during the annual Biomedical Research Conference for Minority Students and American Society for Cell Biology conference next fall as well as the National Conference on Undergraduate Research, the Stetson Showcase and Florida Statewide Undergraduate Research Conference in spring 2020. The project’s preliminary data will be used for additional grant applications. Evans-Anderson — who says she wants to take students to conferences and meetings to “show them the exciting world of research by interacting with renowned scientists in the field” — expects that she and her students will publish scientific research papers in academic journals. Heart disease is the leading cause of death for both men and women and an estimated 610,000 people die in the United States each year. The research findings may provide important clues that could support new treatments for preventing and treating cardiovascular conditions. “Understanding how different genes work together to build the heart can help create new therapies for addressing cardiac defects and disease,” said Evans-Anderson. The Colloquium is just around the Corner – register now! A thought-provoking keynote delivered by Stetson University’s own Community Education Project faculty co-leaders. A day of conversations about teaching, learning and other aspects of university work with colleagues from across the state. PLEASE NOTE that due to scheduling conflicts Dr. Daniil Zavlunov’s spotlight presentation has been rescheduled for April 12th. The 2018-19 Stetson Spotlight Series continues on April 12 with a presentation by Dr. Daniil Zavlunov, Assistant Professor of Music History, who will speak on “The Afterlife of Tselontnyä-Analiz (Holistic Analysis): Topic Theory in Soviet Musicology”. During the 1930s, Soviet music scholars were intent on developing a “Marxist theory of music.” One of the most significant manifestations of that search was the creation of a new analytical method called “tselostnïy analiz” (holistic analysis), which aimed to consider musical structure, content, and context symbiotically. More radically, holistic analysis itself was an attempt to define and legitimize the discipline of music analysis as a “scientific” endeavor and an independent branch of Soviet musicology. One of the distinctive trademarks of holistic analysis was its direct interest in engaging with music’s signifying potential, which engendered a blossoming of musical semiotics, and, specifically, of—what in the West today is known as—“topic theory.” Topics are musical “signs,” commonplaces, or conventions, which are capable of extra-musical signification. They are elements of musical discourse, furnishing one possible access to meaning in music. Significantly, Soviet topic theory predates that in the West by some decades. My Spotlight talk explores the philosophy behind and ideology of holistic analysis, and then considers one of the analytical system’s most important contributions. Daniil Zavlunov is a musicologist specializing in nineteenth-century music, with a particular emphasis on the Russian and Italian operatic traditions. Over the last decade, his research has focused on the works and world of Mikhail Glinka. At present, Dr. Zavlunov is writing a cultural history of opera in Russia during the reign of Nicholas I (1825-1855), which draws heavily on new archival sources. His other scholarly interests include 17th- and 18th-century music, Soviet music and intellectual thought about music, theories of musical form, and music analysis. Some of his research has appeared in The Journal of Musicology and Music Theory Online. In recent years, he has held visiting appointments – teaching music history and theory – at Princeton University, Dartmouth, Skidmore and Haverford Colleges. At Stetson, Dr. Zavlunov teaches a wide variety of courses in the School of Music, the Department of Creative Arts and the Program in Russian, East European and Eurasian Studies. In addition to his pedagogical and scholarly pursuits, he is also an avid harpsichordist. For those of you participating in a teaching square, you should have finished your course visits. Take some time now to reflect on what you learned. This is a personal experience for you. You may wish to share it at the square share, but there’s no requirement to do so. The questions below can help guide your reflection. You will gain the most if you write your responses and allow each reflection to lead to other thoughts about your own teaching. What have I learned about my teaching philosophy from my classroom observations (it could be something new or something that has been affirmed)? What personal values do I bring to my teaching? Has my teaching philosophy changed as a result of this experience? How has the experience of again being in the “learner” role impacted my teaching? What surprised me during this experience? What challenged me during this experience? What assumptions about teaching did I confront? What have I learned is one of my teaching strengths? What aspect of my teaching do I wish to improve? How am I going to do this? What is one thing I learned that will make my teaching more effective? Did I learn any tips, tricks or best practices that I might want to incorporate in my teaching? Is there one particular thing I learned that I will apply next semester in my classroom? Why was this one thing so impressive? Learn more about Teaching Squares. Happy International Women’s Month! As we enter March, be on the look out for events around Stetson University’s campus that helps support and empower women. To learn more about International Women’s Day and this year’s theme, please visit the campaign’s site. Please show your support (and have fun while doing it) by coming out to these events or donating! See the calendar below. The 2018-19 Stetson Spotlight Series continues on March 15 with a presentation by Dr. Deborah Goldring, Associate Professor of Marketing, who will speak on “Corporate Rebranding: Understanding Managerial Motivations via Controlled Messaging”. Companies are under constant pressure to maintain customer authenticity and face unrelenting competition in the market from other brands who strive to gain consumers’ attention. A brand’s corporate name can break through the visual clutter and noise to create an up-to-date brand identity. While in the past, companies may have preserved the same brand name for years or even decades, now companies regularly renew their brand names. The balance between refreshing the brand and maintaining the existing brand is of critical strategic importance. Prior research has focused on theoretical frameworks for corporate rebranding that go beyond mere administrative necessity; however, there is an opportunity to empirically explore the internal managerial conditions that provoke corporate rebranding. This research, in its early stages of development, examines the antecedents of corporate rebranding efforts. Deborah Goldring is an assistant professor of marketing in the School of Business Administration at Stetson University. She teaches both undergraduate and graduate courses in marketing. She has more than 20 years of leadership experience as a marketing executive with small- and medium-sized businesses in industries including healthcare, manufacturing, technology and professional services. Dr. Goldring earned her Ph.D. in marketing from Florida Atlantic University. Welcome back! I hope everyone had a restful and productive spring break. If you are a member of a Teaching Square, then you will hopefully be finishing up your classroom observations within the next few weeks.